Looking for the best travel gadgets to bring on your travels or give as a gift? While there are many gadgets that travelers would love there are some essential travel gadgets that are must haves. I like to travel with carry on luggage only so I don’t like to bring any extra gadgets with me unless I absolutely need them. 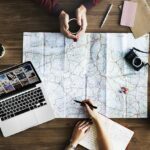 Here are my picks for the best travel gadgets that every traveler must have in 2018 and 2019. If I had to pick the most useful travel gadget other than a smartphone, it would be an external battery. I always carry at least one of more external batteries to charge my phone and other electronics when I am not close to a power outlet. My smartphone runs out of battery so fast that I cannot live without one! A universal travel adaptor is a must have gadget for any international traveler. Noise cancelling headphones are useful gadgets for travelers who want to sleep on a long flight. These are the best headphones I have found. A Kindle Paperwhite is another practical gadget for travelers. Getting lost in a book is one of the top suggestions on how to survive a long flight in economy. This is also a space saver for long term travelers because you can download your favorite travel books on your kindle, instead of bringing a bunch of books with you. Do you spend a lot of time outdoors or will you be traveling to countries where the water is not safe for drinking? Save money and the environment by using this personal water filter instead of buying bottled water. This personal water filter makes contaminated water safe for drinking by removing waterborne bacteria and parasites so you can use it to drink directly from your water source. A compact power strip is one of the most useful travel gadgets. I use one when I find myself somewhere with few power outlets and want to charge multiple electronic devices. For travelers that want to take photos while being active or underwater a GoPro HERO7 Black is a must have item. If you want to take good photos but don’t want to bring along a bulky DSLR, a mirrorless camera is the way to go. I love the Sony Alpha a6000 which gets great reviews and is one of the more affordable options. If you want to splurge, the Sony A7 III is one of the best mirrorless cameras. A portable gorillapod is useful for travelers that want to take better photos but don’t want to carry a large tripod. There are gorillapods for DSLR and mirrorless cameras and gorilla pods for point and shoot cameras. I especially love this gorillapod for smart phones that comes with a bluetooth wireless remote for selfies and group photos. This surge protector has 3 outlets and 2 USB ports to protect your electronics from power surges and charge multiple devices at the same time. Perfect for couples or families, a headphone splitter allows you to connect two or more headphones so that everyone can enjoy your playlist or movies. A digital luggage scale is a must have if you want to be sure you don’t overpack and have to deal with overweight bag fees especially when flying on low cost airlines. Perfect for backpackers or travelers staying at a hostel, you can use a headlamp instead a flashlight. Want a selfie stick and a portable tripod? This gadget does double duty as both. If you want to take those amazing aerial photos you see on instagram, you might want to invest in a travel drone. One of the best travel drones is the DJI Mavic Air which is small, foldable and portable. The DJI Spark is a more affordable and compact option. If you like to be one of the first to try the newest gadgets, check out the new DJI Mavic 2 Pro and Mavic 2 Zoom. 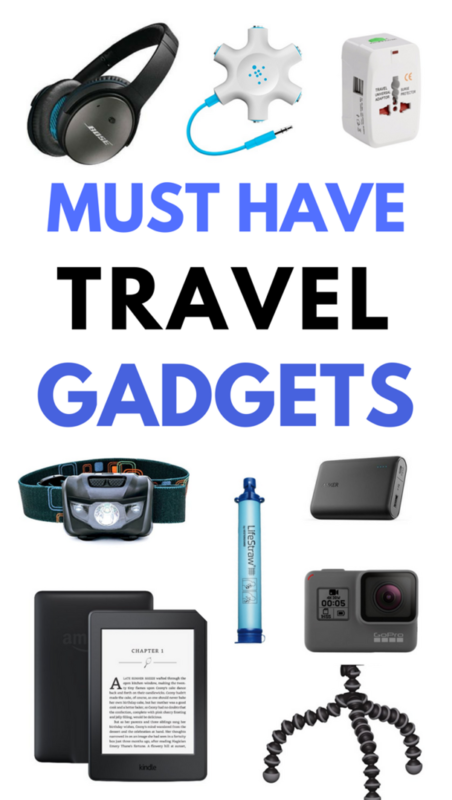 What are your favorite travel gadgets? I’m slowly starting to acquire these gadgets little by little! This is a great list! I love my Kindle Paperwhite–I can even read it on a sunny beach and I don’t need to bring booklights. I always forget my own headphones, but we have these really cute panda ones for my youngster that she adores. I love pandas-need to look into getting those panda headphones for my nephew. My brother wants a drone for video so badly but someone told him they aren’t allowed on all planes. Do you know if that’s true? Such great products, I have most of them! I would be lost without my external charger and the gorilla pod and scale both come in handy! I have the external battery and the noise cancelling headphones at the moment and I don’t think I’d want to travel without them again. That battery has saved me from getting lost many times by charging my phone. Some of these gadgets I use and some were new to me. Thanks for the list! The perfect list of gadgets for travelling! I couldn’t agree more to your list, and as I see them one by one, I keep nodding to myself saying, I do need these! A powerbank for emergency juice. A universal travel adapter, ’cause you can never know what sockets can you expect in different countries. And of course, you can never go wrong with Sony mirrorless camera A6000. 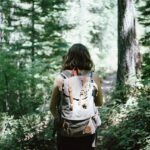 Thanks for sharing your list!